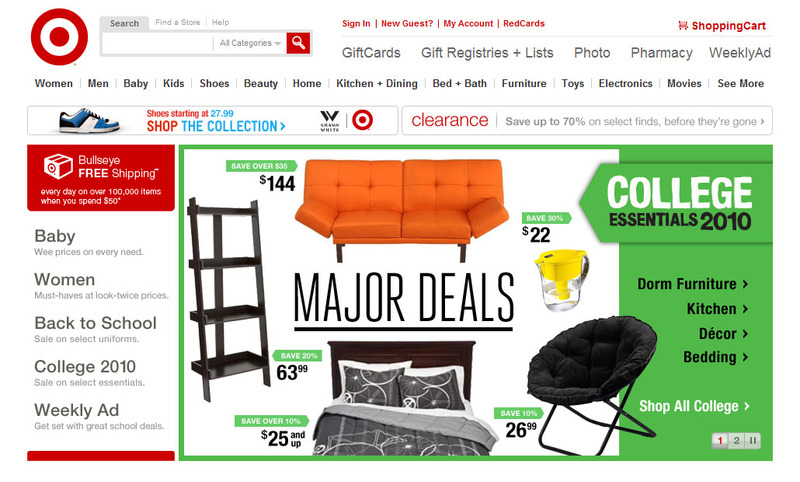 The front page of Target.com, where you can get all of our essentials for going to college. I think I have lost count of the number of times my wife and I have been walking around Target, looked at all of the “dorm gear” that’s on sale and said, “I wish they would have had this when we went to college.” I mean, every single time, without fail, as we wheel the cart past the school supplies or toward the granola bars and spot a mini-fridge or stackable storage containers or three-pack of Old Spice body wash, we scrunch our noses and remark how good kids these days have it. Too bad the economy is so fucked that they won’t have jobs when they graduate. BWAH-HA-HA!!! Okay, that was rude and probably uncalled for. But I have to admit that I’m kinda jealous that everything the kids in my area who are attending college need (and then some) can be found at Target of all places. I didn’t have the convenience of a Target when I was heading off to Loyola back in the summer of 1995; instead, Sayville had a K-Mart that was so hectic and disorganized that I once nearly had a panic attack when I stepped inside. And I’m not the type who is prone to panic attacks. I don’t know, I just find it kind of both genius and funny that Target and other stores like it have latched on to going away to college and turned it into a shopping season of sorts, the kind of thing that you throw in to the back-to-school sales on July 5 and take down the day after Labor Day because the Halloween candy needs to be shelved. If they did this fifteen years ago, I completely missed it, as I had to deal with schlepping out to Linens and Things on Sunrise Highway in Patchogue about a week and a half before I headed to Baltimore. They could have been running a sale, but I was completely oblivious to it and I don’t remember seeing commercials about outfitting me with a laptop and all sorts of wireless wonder so that my life was complete in the dorm. Then again, it was 1995 and my graduation present was a Packard Bell desktop PC with a 2400 baud modem and HP Laser Jet 4L printer, which took up half of my parents’ car and my friends were all carrying beepers around in their pockets. So … yeah.